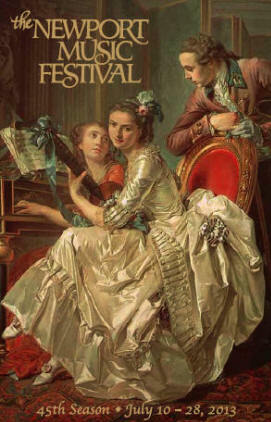 The 45th season of the Newport Music Festival presented music from the Romantic era in 62 chamber music concerts – up to six per day – over two and a half weeks, performed by 90 musicians (almost 60 making their Newport debuts) from 18 countries in eleven Newport venues. Seven concerts celebrated the shared bicentennial of opera giants Verdi and Wagner. This year’s expanded repertoire encompassed tango, jazz, and klezmer music. The closing weekend, for example, included “Tangofest,” a program that featured classical musicians performing arrangements by Astor Piazzolla and other composers written in the rhythm and spirit of the Argentine dance form. Piazzolla’s “Le Grand Tango,” played by cellist Jiri Barta and pianist Grigorios Zamparas, and Ernesto Nazareth’s “Odeon” played by pianist Daniel del Pino were particular audience favorites. A highlight of the festival was a “Tribute to Dave Brubeck” presented in the Breakers mansion by the Jazz Arts Trio and alto saxophone player Billy Novick. The classically trained musicians gave scrupulous but spirited accounts of many Brubeck standards, from “Take Five” to “Blue Rondo a la Turk.” Three rare nocturnes for solo piano, beautifully played by the trio’s pianist Frederick Moyer, featured vocal commentary that was consistently informative and engaging. A good number of the above artists are Festival veterans of as many as sixteen seasons, and their performances often radiate the joy of making music with longtime friends and family. Their passion, combined with spectacular performance venues, including several mansions, the Newport Art Museum, and the historic Touro Synagogue, creates a unique formula for a winning music festival.